by Bill Dwight on Monday, October 08, 2012 at 7:15 PM | LEAVE A COMMENT! 03:35 The gap between the piggy bank and the real bank. 04:30 Why parents need to be involved. 04:51 The virtual family bank concept. 10:59 It’s really about ownership, constraints, and management. 15:10 Technology can really help parents. 16:33 Physical to digital: understanding all forms of money. 22:33 Numbers don’t nag. They can defuse the emotion. 27:20 It isn’t just about managing money. It’s about building values. 28:22 The power and freedom of long term saving. JIM: Hi everybody, this is Jim Higley. 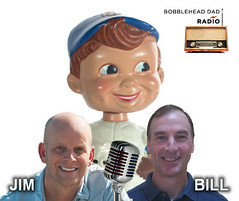 Thanks for joining us right here on Bobblehead Dad Radio. So when my oldest son was born, someone gave him a cute little piggy bank. It was silver, and I remember putting that on a shelf in his nursery and thinking of those precious moments that he and I would have years down the road when he’d pull that little piggy bank off his shelf and shake loose some coins so we could go out maybe to the candy store and buy some candy or maybe a coveted baseball card. Oh man, did I go into fatherhood with nothing but Hallmark moment ideas in my head. Well, today that little boy is now 23 years old. He’s out of college, working, has credit card bills and like so many other young adults, he’s facing the realities and difficulties of managing his own money. You see, in between those two moments in our life — the moment when the little boy with the piggy bank in his nursery and today when he’s an adult managing his own finances, there were a lot of teachable moments. A lot of opportunities for the parent to teach him. And the same with his brother and sister. To teach them all about money. And it’s really one area of parenting I wish I could have a “redo.” Because I now can see how critically important it is to teach small children about money — about managing money, about saving, about spending, and for me and my family, about charity. So, today, we’re going to explore this topic. Kids, money, spending, saving, and charity. And we’re joined by a guy who knows a lot about the subject. We’ve got Bill Dwight who is Founder and CEO of FamZoo. 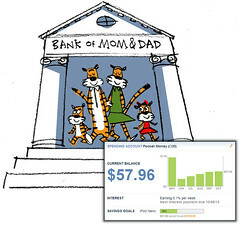 It’s an online virtual bank that helps parents teach their kids about good personal finance. It’s pretty neat. So neat that the product won Best of the Show at last year’s FinovateFall — a conference in New York City highlighting financial technology. And FamZoo was listed next to FourSquare in Doreen Bloch’s book The Coolest Startups in America. Very cool, very impressive. But before we’re gonna talk about some of those cool things that Bill’s brought to the market, we’re just gonna talk to him as a dad of 5 kids. BILL: Hey Jim, thank you for having me. JIM: Absolutely. OK, so before we start, walk us through the ages of your kids right now. BILL: Oh boy, let’s see if I can remember them! I know the youngest is 10. Quintin. JIM: That’s a good starting point. BILL: We do have five and we kind of ran out of names, so we gave him a numeric based name index with Quintin. And then we have two in high school and we have two college-age kids. So, 22 down to 10. JIM: So you and I have some similarities. We’ve got that spectrum of younger kids. You have one, Quintin’s a little bit younger than my youngest, but you and I kind of represent that full spectrum of children who’ve left our house and are kind of quasi on their own. So let’s turn this into a show for all those moms and dads out there — especially the ones with younger kids who are scratching their heads about this topic thinking, how do we best help our kids understand about money? So, there’s so many topics I want to talk to you about in terms of controversial things: allowances, yes or no? Do you pay for this, do you pay for that? But before we do this, let’s provide some context for our listening audience about what your journey’s been in terms of how you’ve handled this with your family and how the product FamZoo has come to be. BILL: Absolutely. We started exactly as you described in the intro with a piggy bank and that’s where everyone starts and usually at some point they end up at a real bank. There’s just an enormous gap between those. 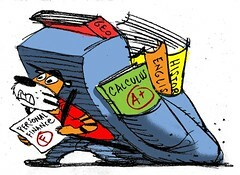 And so as our kids were growing up, we were looking for some way to get some sort of hands on personal finance experience to fill that gap before they went off and made mistakes in real financial institutions. So we start with the piggy bank and when you’ve got 5 rambunctious kids, the piggy bank is not your safest place to keep your money sometimes. BILL: And, furthermore, even if they were doing it, in schools, money and values are so intimately intertwined that the families really need to be involved one way or another. BILL: So I sort of got this idea which I thought was original but it turns out it’s not original — there have been books written about the notion of running your own family bank where mom and dad are the bankers and you’re just being a little more systematic about tracking things. In fact, there are two really terrific books — one is The First National Bank of Dad written by David Owen. JIM: OK, I’ve heard of that, yeah. BILL: Another is The No-Cash Allowance written by Lynne Finch. I think they’re wonderful books and they describe the concept. You know it’s funny as parents we always think we discover everything ourselves and then realize that these concepts have been around forever. It’s basically just you’re keeping track of what you “owe” you kids. We can talk about income sources for your kids — whether it’s allowance or chores or whatever or just outside jobs — but the important thing in my mind is that they have some money that they can earn and call their own and then make decisions with. JIM: I want to interject one thing here, too. I want to make sure moms and dads who are listening to this are totally aware that neither you or I are saying “you need to give your kids allowances a 100 percent.” To me, the main message is, hopefully moms and dads, you need to teach your kids how to manage money. How your family sets up its value system and however you help your children earn or receive money is up to you. That’s an individual decision, but your kid will be a more knowledgeable child and better equipped to get into adulthood and even teen years if they understand these concepts of money, right? BILL: Yep, precisely. For me the whole debate about: Do you give them an allowance? Do you link it to chores? Do they just do outside jobs like babysitting or whatever? To me, that’s an interesting set of discussions but it’s not the critical thing. Decide what makes sense for your family, but make sure your child has some control over some money that they can make spending decisions with and more importantly spending mistakes with. JIM: Yeah! Like you’ve said before, these are teachable moments. 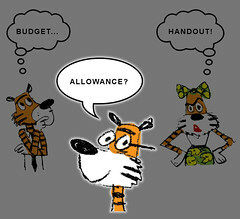 The other thing I just want to throw out too, is back to the topic of: Do you do allowance? Do you not do allowances? I’ve done it all. Really. I’ve got older kids that I was much more rigid with. Very detailed programs where they’d earn a nickel for doing this chore, then a quarter and they’d lose a quarter. It was so complicated it made my head spin. But, and we can talk about how exhausting that is later, truthfully, especially for my oldest son’s personality, it kinda worked. He likes that kinda stuff. He’s a very mechanical kind of kid. That whole concept doesn’t work for my little kid — the youngest. BILL: You mentioned a couple things that are really important here. One is age. The opportunity for income for a 6 year old is dramatically different from the opportunity for income for a 16 year old. One of my sons, Will, is a lifeguard. He’s old enough to go out to a local country club and be a life guard. That’s an income source, so I don’t need to pay him an allowance. But our 10 year old, there aren’t a lot of jobs out there for a 10 year old. But some parents are extremely creative in creating jobs for their kids, and I think that’s a wonderful idea. But the point is that this is a very age dependent thing. I think that allowance is particularly useful if you want to use it for younger kids where they don’t have these other opportunities. JIM: To me one of the most complicated things as a parent — and this is especially as kids get older — when they’re littler, whether you give them allowance or not, in my opinion, I don’t think it’s a huge deal because you’re dealing with little numbers, you’re not dealing with big dollars. To me where it gets complicated as a parent and as a mom and dad is when they get a little bit older and suddenly they need a lot more money, supposedly, for kinda just the social part of their life. They go with friends and they want money to go get ice cream or go to the movies. And suddenly you have to wrap your head around as a parent (a) what can I even afford and (b) what am I willing to and not willing to just give to my child. Do they have to earn it? To me that’s a really complicated decision. BILL: To me, the most important thing, regardless of how much you force them to earn externally vs how much you give them, is that they’re operating against a constraint. BILL: I like to take an area of spending that a kid is very passionate about. It depends on their personality. For my daughter, it was clothing. She loves clothing, and that’s fine. But I want her to operate against a constraint so she has to make tradeoffs and decisions. If she’s going to get that Neiman Marcus gown, then she needs to make tradeoffs elsewhere and go cold turkey for four months or whatever to make it fit into a reasonable budget. BILL: And what’s reasonable depends on your situation, your relationship with your child, their personality — all kinds of things. But everyone, I believe, should operate against some form of constraint so they have to make tradeoffs. And this all gets to experience. My whole point is you talk about the day you got the piggy bank for your son and then it seemed like in just a flash he’s 22, and he’s dealing with credit cards. JIM: Right, and he’s stressed out because a lot of this stuff is new to him. JIM: I want to toss out a comment here. Your comment about teaching your kids to operate within constraints is, to me, one of the most important things that I hope people are really listening to. That, as a parent and working with children, I fully agree is if not the most, one of the most important tools, probably even outside a financial discussion of knowing what their constraints are — what the real world is. In preparing for this, I was reading some little article and it was “the problem with today’s society is all of our kids know exactly where our money comes from: it comes from the ATM machine. When you need money, you just go get it!” And that’s really true. Many kids — mine included — sometimes don’t realize where money comes from or that Dad has saved money in order to do some of the nice things we’re able to do occasionally. It’s not just that it literally doesn’t grow on trees. BILL: That’s a really interesting point, and I think one mistake that parents frankly make is sometimes they give their kids too little credit. Like I was walking to school with Quintin just the other day and he says “Dad, how does a credit card work?” And I’m like, “ohh ok,” and we talk about the concept of how it’s really a loan — a really crappy loan by the way. It’s cool if you pay it right away, but if you blow it, you’re gonna be in trouble. And we walked through even what merchant fees are. The concepts — you can simplify them. And they’re really pretty simple concepts. You don’t need to go into a grand detail. And he totally got it. He gets it. He’s like “hey, why at the noodle house do they just accept cash?” And we talked about merchant fees. 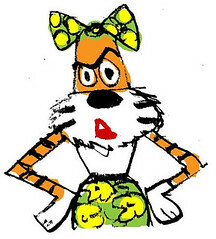 BILL: Which I actually had on a subsequent day.. I said, “Hey, Chris says maybe they’re not paying taxes!” The point is, he’s ten, and he totally gets this. And as much as I like to think all my kids are little Einsteins because of course they’re my kids, but they’re just normal kids. And they get these concepts. If we take the time to explain them. 15:20 Technology can really help parents. And you know me, I’m really into technology. I happen to think that technology can really help parents because you talk to so many parents who are like “Yeah, I tried the allowance system, or the chore system. It started out great and then I forgot, or it was just too much of a hassle.” And that’s where technology can automate a lot of that. JIM: I want to jump into that, but my personal testimony is, I was one of those guys. My oldest son was a toddler long before we all had laptops connected to us and iPads. I’d literally go to the store and buy big cardboard boards and make charts. And I’d stress out because I’d realize, oh my gosh, I’m out of quarters and I have to make an emergency run to the bank to get several rolls of quarters. And it just got complicated. Then, like you said, also having literal banks in the house — I’m embarrassed to say this, but I got to a point where I would steal his money out of his piggy bank to pay him, because I forgot to go to the bank. And, then it became this horrible nightmare of, oh my gosh, did I pay him back or not pay him back, but I can’t tell him I took it because, that’s not a good lesson — that you take money without asking. I was so stressed out, literally, after doing this for a couple years — or however long I did it — that I’m embarrassed to say I just petered out. BILL: Well, Jim, I think that the discussion about physical money is actually really interesting, too, because I hear a lot of this comment “I want my child to understand physical money — touch it, feel it.” I do think that’s important initially when they’re first getting what a coin is, what currency is. But I actually think it’s imperative that they understand electronic forms of payment — they understand that this number in my spreadsheet or on my ledger or wherever your keeping this, represents real money, because this is how a lot of people get themselves into trouble. They start to think that the credit card is not real money or the ATM is not real money. I think the sooner that kids can understand multiple forms of payment and especially electronic forms of payment, the better, because that’s the world they’re going into. We’re not going to roll that back. They need to understand that. JIM: Well, you know what? You have 100% in the last 90 seconds just changed my mind on something because I’m old school enough that I’ve always thought that you need to teach kids with tangible money. They got to understand exactly. And I know you’re not saying that’s not important. BILL: I think that’s a great start. JIM: But, you’re right, you really are right because I’m picturing especially my high school kid. We’re at a store and he sees a $120 dollar pair of shoes that he just instantly wants, and I don’t think he makes that connection in his head: $120, that’s the equivalent of X number of weeks of allowance. I don’t think he’s making that connection. And, you’re right — when I finally give in, I pull my credit card out, and there’s no money that he’s seeing change hands. It’s magically paid for and he never thinks about it again. BILL: See this is where I would pull my credit card out. But first, before I even pull it out, Quintin would say “Dad, let’s check my balance. How much do I have? Oh, I have $130 dollars.” Let’s say its a $120 item. “Hmmm, do I want to spend this?” Now note how it’s “Do I want to spend this?” It’s not “Dad, will you buy this for me?” It’s like “Hmmm, I know I’m saving for an iPad and I’m really gonna torch that goal if ...but maybe I just want it, right?” So I would pay for it on my credit card or whatever, and then we would subtract from his balance that amount. I might be buying a bunch of other things at the same time and he might be too young to have his own banking account, a debit card and all that stuff. He’s 10. JIM: To back up to what you were just saying. 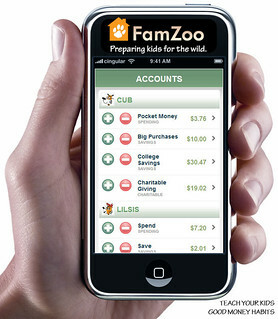 In the scenario you just painted with your son, you’re actually saying with your product, with FamZoo, your pulling up your smart phone and looking at balances right then and there at the point of purchase. BILL: In our case yes, but you could do this with a paper ledger. You could walk around with a ledger that is “Quintin’s Account,” and you could just deduct right then and there. You might choose to do it with a ledger initially for a while to teach math. I just deducted 120 bucks. Now kids catch on really quickly. In my case, the thing that has impressed me so much in the last six years since starting FamZoo: parents are insanely busy! We all have a tendency to think we’re just the only ones, but as I interact with more and more families, that is the one truism. JIM: It’s a home run feeling as parent when you know you gave them something, and that it’s actually something that is going to really last for the long haul. Tell us a little bit more about FamZoo then. JIM: I wouldn’t feel much of anything. I’d probably feel real guilty, yeah. BILL: So, philanthropy is really meaningful if they are doing something with their time or their money. In our family, by the way, we happen to do a regular allowance, but then we got a little frustrated if they would blow off their chores, so we don’t have a chore chart, we have what we call a “chore fail” chart. So if they don’t do a chore, they actually get dinged against their allowance. That’s just the way we do it because with 5 kids, it got too exhausting to run around and compute all this stuff and we change it as the kids get older, but that’s the general idea that we use. JIM: Exactly. There you go. Talk about teachable moments, yeah. BILL: You can just let her account go negative, and have the allowance fill that back up over time. So, In the meantime she’s relearning the lesson each day as she’s foregoing going out with her friends for pizza or whatever. It’s like “no, I can’t, I’m paying back this window.” So it’s neat to have all that tracked. The nice thing about numbers is numbers don’t nag. I stole that from Lynne Finch from her No-Cash Allowance book. She has a great passage in her book where she says “numbers don’t nag.” It makes it almost — it sounds impersonal — but business like. It’s an agreement between the kid and the parents. And so numbers just have this way of being sort of calming. It’s like “yeah, that happened, and I’m paying it back.’ And the same with having a clothing allowance and a clothing budget. It’s like, that’s an agreement. And furthermore, kids crave responsibility and ownership. JIM: I couldn’t agree more. 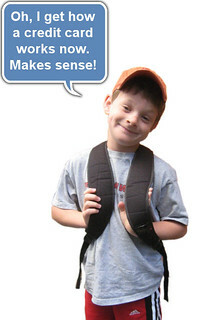 So, taking this to it’s simplest form: at some age every child is ready to start to understand the concept of money and value and what you’re saying is with your virtual bank — and I’ll make it super simple, let’s say a five year old — I can set up basically a system, and I’m going to give Junior a dollar a week. As a family or as the parent, I set the parameters with my child — what the rules are of how that money is used. I might say “of that dollar, Junior, 50 cents is yours to do whatever you want — you can buy candy or whatever mom or dad agrees to — and 25 cents, you going to save for a long, long, long time because we’re going to save up for something special someday, and 25 cents we’re going to save to give to people who need help.” It’s a tool that Junior can also jump online with as well, right, and access his or her little account. JIM: Interesting. Yeah. Fun, yeah. BILL: Because there’s always change lying around. Or, checks from grandma for a birthday and so forth. So, this is not just for wealthy people or people who spend a lot of money on their kids. This can be used with arbitrarily small amounts. The important thing is that your tracking and you create constraints. Anyway, so you might engage you child in a conversation that says “my only rule is that you have to split it these three ways. What do you think is an appropriate set of splits? 80/10/10? 60/20/20?” So my kids actually have different splits based on their opinions. JIM: Again, a very good teachable moment and probably some kids will say “I think I should get 100. All of it should be mine.” But again, what a great way to get into a conversation. BILL: Yeah, I draw the line at like 100. It’s kinda like you said for the spending one: they can buy anything they want. Okay, beer and cigarettes? No. JIM: Right. Please. But I mean, in seriousness, what it does, as a parent — and I know you go through the same thing, especially as your kids get older — you’re having conversations that ultimately get to value systems and very personal ways of living your life. I cherish those moments as a parent. You know, when you have those moments in the car where you say “wow, I just had a great talk with my son that I wasn’t expecting.” This opens another door. 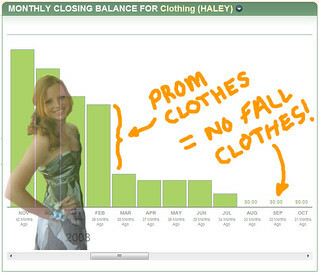 This isn’t about just a neat tool to manage money. I think as a parent, it must open some pretty cool doors about values and what’s important. I love it. BILL: The neat thing is that you don’t have to confine yourself to spend/save/give buckets. It’s your bank, you do whatever you want. Some people set up some amazing banks. It’s really interesting to look at them. Some people do a “tax account.” They say, x percent is coming out, and our tax account is saving toward our family trip to Disneyland or something like that. What’s cool about this is kids that grow up on this system like our youngest — the notion of some money automatically coming out of their paycheck is completely natural. What I was looking to do is: I had this really fortuitous experience working as an executive at Oracle. 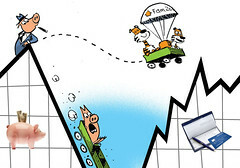 When I became an employee, I decided to participate in the Employee Stock Purchase Program. So that money came out of my paycheck and, you know, I never really thought about it anymore. Well, 25 years later, guess what contributes a lot to funding my company? That employee stock purchase program. That gave me the financial independence to pursue my own mission driven business. That’s what financial control is all about. You get to pursue your passions if you’re financially stable. Money doesn’t make you happy, but it can cause a tremendous amount of unhappiness if you don’t have it under control. JIM: Couldn’t agree with you more. BILL: And I was thinking, “gosh, I like my kids to have that kind of experience or realize the power really early.” And so we split between spending, saving, and giving. The spending bucket, they use for spending every day stuff and for saving up for things like that iPad — things that take a while to save for. But one of the buckets is Long Term Savings. And what is long term savings? In our family — first of all, I give them an insanely aggressive interest rate on their long term savings — 10% is coming out of their paycheck for savings and I give them an outrageous interest rate per week. And they’re seeing that on their dashboard. And the deal is: when they get their first real checking and savings accounts, I take what’s in that long term savings which has been getting that “Bank of Dad’ interest rate that’s crazy, and I deposit that in their real savings account. And that day — I’ve been through this now with the older kids a couple of times — they’re like “Whoa, nice windfall! 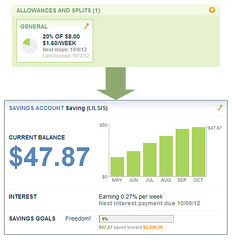 Wow, that is real money and I’ve been watching it grow and now it’s under my control. ” It’s almost exactly a microcosm of the experience that I had with that Oracle stock program. JIM: Well, great lessons for teaching kids, and clearly this is a product that can grow with them as they mature. We are at the end of our show. 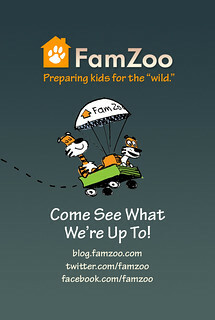 Where can people go to get more information on FamZoo? 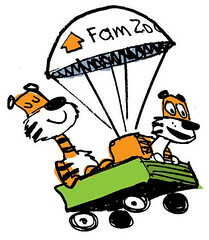 BILL: Well, they can go to FamZoo.com, and that’s short for “my family is a zoo,” by the way. JIM: OK — F-A-M-Z-O-O dot com. BILL: And if you just want to participate in the conversations about it which I think are as interesting as the product — the product will save you some time — but you can go to facebook.com/famzoo and that’s where we discuss all these issues. JIM: Perfect. Well listen, thanks for joining us. this has been a really fun talk and hopefully some moms and dads out there are starting to scratch their heads and think of some new ways they can start instilling some great money strategies for their kids. And, I appreciate your time, Bill. BILL: Jim, thank you, and a great site you’ve got. JIM: Folks, as always, you can learn more about me at my web site — bobbleheaddad.com — and while your there, I hope you’ll check out my blog and links to stories I write for the Huffington post as well as video contributions I do for NBC Universal’s iVillage. Keep checking back everybody, and thank you for helping us celebrate and explore the changing world of dad-hood.